Nick Churchman, the Guild Steward, will be giving a morning's training session on bell maintenance on Saturday, 21st October. It will be held at Uppingham Church tower, starting at 10.00am. Louis has been involved with maintenance issues in a couple of towers recently. He did a belfry inspection in a tower with bells that are rung infrequently (and highlighted a problem). In another, he has undertaken some essential repairs. If anyone else wishes to take advantage of his skills and expertise and would like Louis to do a check on the general condition of their tower, he is very willing to offer his assistance. After our tower captain, Paul, passed away in July, we held a meeting to determine the way forward for ringing here in Whissendine. 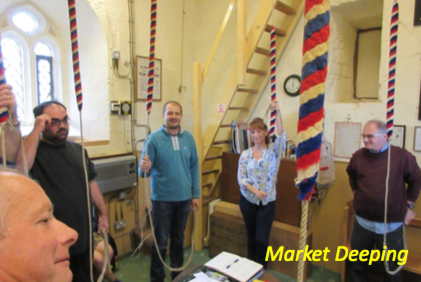 It was decided that we would put out a call for new ringers, lapsed ringers and more expert ringers to come ringing once a month to try to keep our bells ringing. We have been pleased to welcome new ringers Maldi, Sarah, Peter, Julia and Cheryl to the tower and they are all making good progress. We also have welcomed Chris and Di who have rung elsewhere several years ago but are keen to get involved. With so much interest and very welcome support from branch members – especially Peggy and Ray – we are now ringing every Thursday night from 7.30 to 9pm and also for Sunday service. Mary and Andrew Davidson celebrated their Golden Wedding anniversary at Caldecott on Saturday 9th September. Without Mary knowing, ringers from the towers she regularly rings at assembled at Caldecott to celebrate the occasion. General ringing commenced at 12.00 to coincide with the start of Mary and Andrew's party in the village hall and continued for about half an hour. The ringers send their best wishes to Mary and Andrew for many more years of married bliss together. David Murcott. A quarter peal of PBD was rung at Ryhall on 1st October, as part of the Harvest Festival celebrations. It had been a long me since the last one was rung here (Jan 2014!) so there were a number of ringers who had come through the ranks and were willing to give this a go. It was always going to be a challenge, with no fewer than 3 of the ringers attempting their first quarter! It had its rocky moments, but hats off to Ethan Szyszka (treble), who, although one of the newbies, did what he had to do, and was in the right place at the right time, so helping to hold it together. A big sigh of relief at the end, but well done to all concerned. JaneMcKee. A friendly welcome on a warm, dry Saturday in late September was received by the Rutland Branch of ringers in the picturesque towns and villages of Lincolnshire. Up to 15 ringers of all ages from teenagers to, well let’s say considerably older than that, and from various towers including Braunston, Oakham, Uppingham, Rhyall and Casterton visited 4 different churches for their annual tour 2017. Joining them were father and son, Graham and Harry Cane from Portsmouth who had seen the details on the website. Their mission, to “bag” 4 more towers to add to Graham’s already impressive tally of over 4000. The churches were a hive of activity preparing for harvest festival with beautiful flowers and produce. It felt as though we were adding our bit to the celebration by accompanying their efforts with the joyous sound of the bells (mostly). The tour had been meticulously organised by Alan Ellis and started at Greatford. Market Deeping was the next tower followed by lunch. Experienced ringers had an opportunity to ring different methods including bob minor, doubles and triples. Beginners were helped and encouraged in their development by being supported with rounds and call changes. Hospitality at the Red Lion in West Deeping made for an enjoyable lunch and a chance to have a go at the guild quiz. An opportunity to quiz more experienced ringers about ringing terminology and techniques made up some of the lunch me discussion. 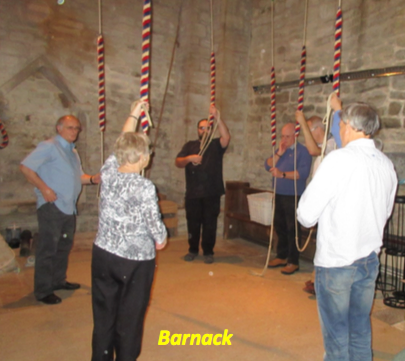 Two towers at West Deeping and Barnack in the afternoon allowed ringers the opportunity to try other methods such as Cambridge, Norwich and St. Martins, sustained in their efforts by homemade biscuits provided by church members. The youngest member of the group, Erin Woods said that she enjoyed visiting different churches and all the beginners agreed that it had been very beneficial having the opportunity to ring different size bells and improve their bell handling. After the day a big thank you to Alan Ellis was proposed and Alan declared that he felt the day had been very successful. Sue Baker. Labels tied or clipped onto ropes – would get in the way and not last very long; would they be replaced at end of a ring ? Coloured stick on tapes – not very practical. Some sort of stain which should not wear off and not hinder any ringing process. What stain to use? Maybe investigate the ladies` hair colourants, there are some very bright colour seen occasionally on the younger generation. I will investigate further with my local salons. This will suit any number of bells and both clockwise and anti clockwise configuration. As an interim I have started to produce small sketches of my local towers; but not particularly enthusiastic as not everybody reads notice boards! Any further suggestions would be welcome – who knows, it could become a national standard! Another option is to produce a Rutland branch poster (template) for use in any tower – this would have to be a reasonable size and assume that people would read it. Maybe we should start a competition to see if we can generate a good one; are there any artists out there? Plenty has been happening since the bells were delivered to St George’s Memorial Church on 31st August. One important thing to report is that the 8 bells have been hung by John Taylor & Co bell hangers Andrew Ogden and Neil Thomas – a very professional job as was revealed when the bells had their test ring on Sunday 17th September. It was a special occasion with Rev. Gillian Trinder welcoming the visiting ringers and then each ringer reading out the inscriptions of the bell they were about to ring. Cambridge Surprise Major was then rung. The bells sound wonderful and handle very well. We were joined by John Arnold, a great supporter of the project. A great photo taken by Neil Thomas is attached - the belfry was described by one of the bell hangers as “the brightest” that he has worked in! Alan Regin has visited the works of Peartree Midlands Limited in Hinckley, Leicestershire, who have been working on the panelling for the ringing room. They have “built” the ringing room in their workshop to ensure it will “fit”. This meant we were able to plot rope drops and make sure that none of the fittings would get in the way of ringers – it is a very compact space! They are building a case that will house the handbells donated by John Coles and the Memorial Book that will be written by Timothy Noad. There are three couple of photographs attached but it really is something that needs to be seen to get the whole view! Since Monday morning of this week Mick Angrave of Sapcote has been working with Mark and Ashley from Peartree Midlands Limited fitting the panelling – their first job was to build a new ceiling – another photo of this work is a attached, already looking very good! When their work is completed at the end of this week it will be the turn of electricians to move in to complete work that was started some while back with the running of a new mains cable and the belfry lighting referred to above. The next stage needed the panelling fitted – their next work includes installing the air conditioning unit into the space created in the new ceiling, running power to the sockets, which will include UK, Continental and USB points, the lighting which will be fixed behind the cornice on the panelling along with the operational side of the sound control system and all associated switches. Also cameras will be fitted to the belfry and the ringing room to allow images to be viewed on a mobile screen that will be placed in the church for the dedication service. This work will be coordinated by Ian Staves of Northallerton who along with David Gardner of Ainderby Steeple designed, built and installed the sound control system. Final visits will be from the decorator who will touch up any recent “rubs” on his fine work and finally a carpet with acoustic underlay will be laid ready for the blessing of the finished installation on Sunday 22nd October 2017 – The service will be full to bursting as we are already right on capacity, over 200 people will be attending. This morning Alan Regin collected the new set of muffles that have been made for the tower by Big Wilf of Big Wilf’s Bell Muffles. Big Wilf has very generously donated these and we are very grateful for this support. We hope you agree that we are closing in on a very fine outcome, to remember those that fought during the Great War and subsequent conflicts – May those that hear these bells remember their sacrifice. As trustees, we are very grateful for all your support, we couldn’t have got this far without you! Trustees, Bells4StGeorgeYpres – remembering our fellow trustee, Philip Vracas. Following the Committee meeting on 22 September a few points that might be of interest to members of the Branch. It has been agreed there will be a team of stewards to be led by Ted Phillips and supported by David Coup and Tom Harley. If Tower Captains require assistance with inspections or simple maintenance then the Stewards will be pleased to help. Any other volunteers (especially any engineers??) will be gratefully received. Nick Churchman the Guild Steward is arranging a training day and if you are interested please contact one of the committee (see the website). The committee will be looking closely at the programme with the Ringing Master, to identify where courses can be created to benefit progression, especially for those who have mastered bell control and are now looking for rope sight. Anyone with a special training requirement (theoretical or practical please contact the Ringing Master or member of the committee). This is not only a matter for York Minster. It affects every tower. If you are teaching ringing or driving vulnerable children or adults on ringing tours or practices then I am afraid you must be CRB/DBS checked. This is not onerous and involves a website return and brief chat with the benefice safeguarding officer. There is a safeguarding course on 23 November in Oakham Church Hall, and all tower captains, teachers and drivers are welcome to attend. Please contact Sue Webster if you are interested. Details of safeguarding courses being promoted by the Peterborough Diocese can be found below. I have also added contact details of personnel at Peterborough who can advise on safeguarding issues or concerns. Sue Webster. Are there any other new members or returning members who might be considered for membership. If you can ring rounds and simple call changes unaccompanied then please let your tower captain or the Ringing Master know. Following the successful event at Ryhall, Oakham is to book the mobile ring (see their website - http://www.charmborough.org) for the festival on 7 July 2018. One for the diary, where we will need all levels of ringers to engage the public. Press will be involved, maybe tv and radio. 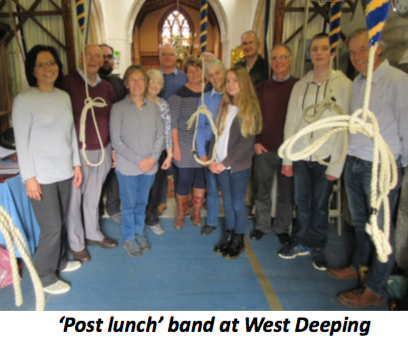 Volunteers required to form a sub committee to maximise publicity and new ringers – see Ringing Master. Next meeting 1st December 2017, ahead of the AGM which is on 13 January 2018 at Ryhall . (with ringing at Great Casterton beforehand). The Church of England has introduced a new modular safeguarding training and development programme for use by Dioceses, Cathedrals and Theological Education Institutions. The programme builds core, generic safeguarding training according to role, and through a person’s ministry path. Please look at each module to see whether it is recommended or required for you to attend. Dates for training events can be found on the Peterborough Diocesan website.